It’s actually kind of funny, Reece Callies said that I was due for my first NLL goal before we went on the floor for the start of the game. We were just joking around but I did end up getting my first one. I had an opportunity on the floor earlier in the game, I passed the ball off but I was itching to shoot. So I was pretty thrilled when it happened, and I wouldn’t have wanted to do it any other game – it was a great win. It’s my second year in the league so getting my first goal is a relief; you get the gears from the guys a little bit here and there. I got my first assist out in Rochester last year, but I’m definitely not known for crossing center with the ball so to get my first one is awesome. 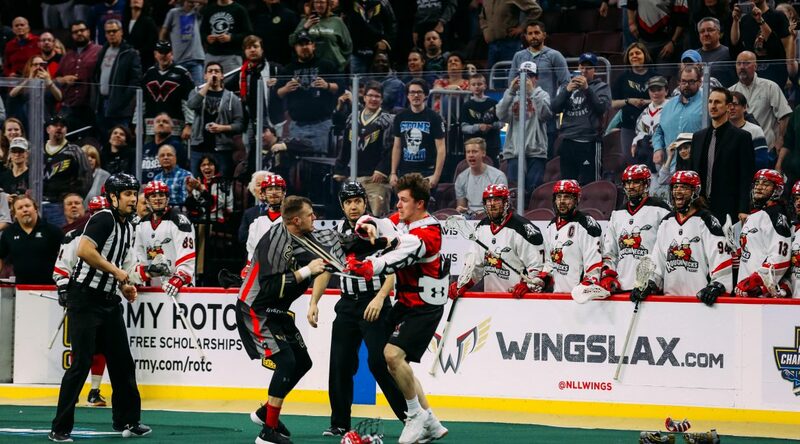 It was a day of firsts for me; I also got into my first fight in the NLL. I kind of got jumped as I changed near the end there and I thought why not? Let’s go. I’m not too keen on fighting but when I have to answer the bell I don’t back down. I think that’s why lots of people would be surprised to know how old I am, I only turned 20 in October. I don’t dwell on that too much when I’m playing, because obviously the majority of the guys in the league are older than me. But it’s fun to show them a young kid can keep up with them, answer the bell and do it at both ends. More importantly though, we won the game. We were very focused on this weekend, we knew what we had in front of us walking into the game. We have been having a tough time stringing some wins together, we’re a little bit up-and-down but I think we’re cleaning stuff up. Saturday’s game showed that we’re coming together as a team, it was a great game top to bottom. Now we’re closing out our season with two games at home, and we can’t wait. It’s always great to be back in Calgary, you come in there and every night it’s the loudest and most energetic place I’ve played in. To have our fans cheering us on while we try to finish our season off on a good note will be great, we’re looking forward to it.